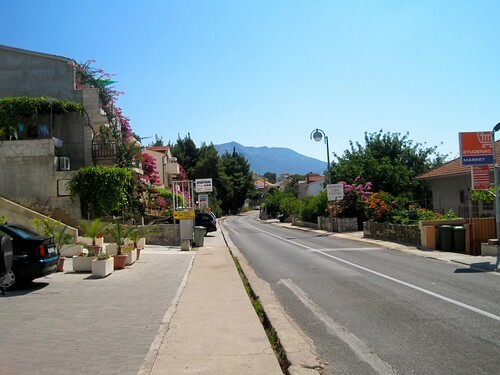 Only appropriate to share about the end of my time in Orebic during my last post about my summer travels! Hope you have enjoyed hearing about some of my summer wanderings, and check out the Adventures page if there are any posts you missed! On our last evening in Orebic, we still had quite a bit of food in the fridge to clear out. We had an eggplant, some fennel, a bag of peppers from Bosnia, half of an onion, some gnocchi, and the other half of our pounded chicken breasts. I daydreamed of how to combine all of these different flavors as I soaked up my last views of the town and the sea, and came up with a plan. I’d make skewers! Too bad the skewers I thought I had seen in the utensil drawer earlier that day turned out to be strange knives. Not a set back, just a chance to think creatively about dinner again! I decided to pair the eggplant and fennel to make stacked rounds of veggies, use the peppers and onions together, and serve that alongside the chicken and the gnocchi, lightly tossed in olive oil salt and pepper. I spent most of my energy on the eggplant. I sliced it into rounds, and then sliced the fennel into rounds. I carefully arranged the stacks, and then drizzled them with olive oil. I drizzled the pan with olive oil as well, and then arranged the eggplant on the pan. Instead of cooking them separately and then stacking them, I was for some reason determined to keep them together the whole time. To cook the eggplant through faster, I haphazardly covered the pan with another frying pan to trap the heat. Satisfied with this, I moved on to prepping the chicken and peppers. 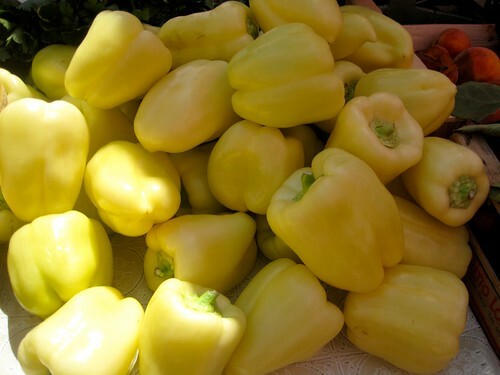 The peppers aren’t your typical densely hued bell peppers. 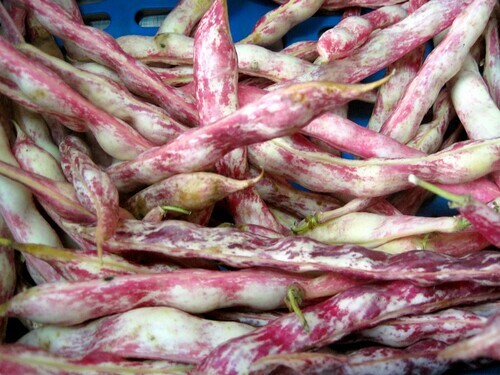 They are pale and a little milder in flavor, and really great to soak up the flavor of what you cook it with. At first I planned to keep these separate, but realized I had run out of pots and pans. Instead, I began to sautee the peppers and onions with some apple cider vinegar. I borrowed my method from cooking the apricot chicken and moved some of the veggies to the side. The chicken simmered in the vinegar and was covered by peppers to maintain the heat. A little ingenuity made up for a lack of kitchen tools! Dinner was satisfying – the chicken was moist while the peppers retained some crunchiness, contrasting nicely. 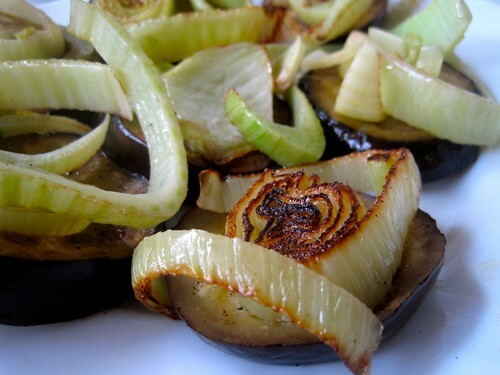 The eggplant was also really tender, even if it didn’t pick up as much fennel flavor as I had hoped. It still looked really cool, so I want to continue to experiment with how to make it better! We all had a craving for ice cream (sledolad), and so walked to town after dinner to visit Azra’s favorite ice cream shop. The employees handle hordes of customers at a time, but always had a smile and often put on a show. I tried rosehip and hazelnut ice cream, which was heaven on a cone. The rosehip had a really intense fruit flavor that seemed most similar to a tart dried cherry, but was much sweeter and more intense. It was countered really nicely by the hazelnut, and I found myself wanting another cone after finishing my first! A great last evening at a great friend’s vacation home. Question: What is your favorite flavor of ice cream? The story of this dinner begins with our infamous train ride from Sarajevo to Ploce. I really wish that I took a picture of our train car, but you will just have to imagine. My friends can attest that my description is not an overexaggeration. The car we sat in looked like it was straight out of 1970. The seats were uppholstered in blue velvet, and were definitely not spaced well. There were two awkward groupings of four, another pair, and a single seat. The were spaced too far apart to maximize the number of people on the train, but too close to want to sit with strangers. We couldn’t find seats together, and so sat two and one, all awkwardly facing Bosnian men. To top things off, my chair was broken and the arm of the seat fell off every time I moved, and our windows were broken. At first this just meant it was hot, but later it meant that we were trapped in lung clogging smoke as a lady in the car in front of us chain smoked for the entire 5 hour trip. The journey was slower than scheduled, it was hot, it was hard to breathe, and we were all a little flustered by the end. The scenery out the window was beautiful, but was not quite enough to make up for the dilapidated and smoke-filled train car. Because food is so cheap at Bosnian markets, Azra thought ahead and stuffed her backpack with market purchases from the previous evening. We brought along figs, plums, apricots, peppers, peaches, onion, and some other veggies for dinners. We were worried about being searched at the border, but the Croatian patrols hardly looked past the American symbols on our passports before walking past us on the train. The Bosnian family behind us was not so lucky, and Azra reported with a smirk that they were trying to claim their bundles of produce as snacks for the train as their bags were searched at the border. While we were cleared at the border, not all of the fruit survived the journey. After being lugged from cab to train to ferry to bus, most of the apricots were DOA. Not being a waster of food, I brainstormed how to use them. Dinner? Dessert? Breakfast? 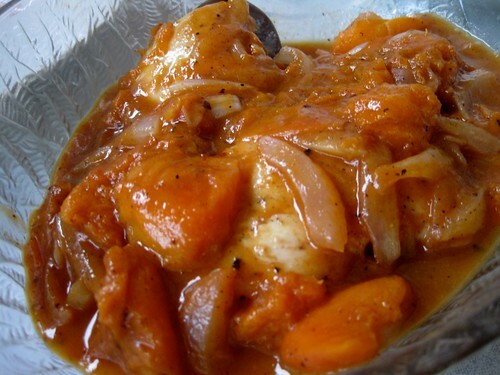 After a trip to the market and purchase of some chicken breasts from the butcher, I knew some Apricot Chicken was in store. First, I pounded out the thick chicken breasts with a frying pan. My friends were alarmed by the noise since I began without warning, but learned the method to my madness. Not only did we get two meals out of our three chicken breasts, but the chicken was also much more tender and took up flavor better once thinned out a bit. To start the sauce for the chicken, I sautéed up half of a white onion in some olive oil. I added around 10 small apricots that we pitted and halved. I let these begin to cook down a bit and then added a splash of red wine for some extra liquid. I moved the fruit to the side and added the chicken breasts to the pan, seasoned lightly with salt and pepper. I covered them back with some liquid from the sauce and let them simmer for a bit on each side. The chicken soaked up the flavor from the sauce, and came out perfectly sweet and tangy. Dinner was served with some gnocchi, which were perfect to soak up the extra apricot sauce. We also cooked up some purple string beans, which I had to have from the market solely because they were purple. They lost some of their color when steamed, but they tasted exactly like green beans! I loved having veggies back on my dinner plate, and was really pleased with my impromptu dinner. I wish I had written down the recipe, but I am too far removed from when I made this dinner to be able to write down exactly what I did. Hopefully the description above is enough of a springboard if you want to attempt to create your own version of apricot chicken! Experiment a little to see what happens… the wine was a last-minute addition that made a huge difference. 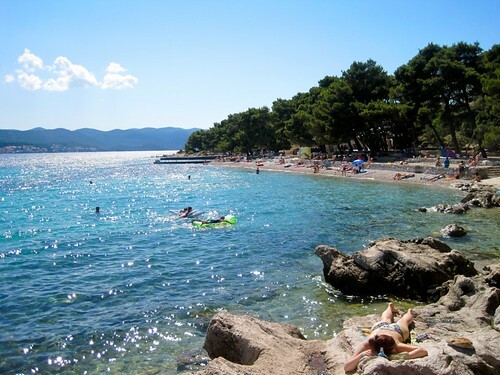 Our daily life in Orebic was all about relaxation. We would run along the ocean in the morning, then walk to the market for fresh bread and any odds and ends we needed for the day. After a breakfast of fresh fruit and bread with nutella, we would make sandwiches and pack our picnic lunch for the beach. 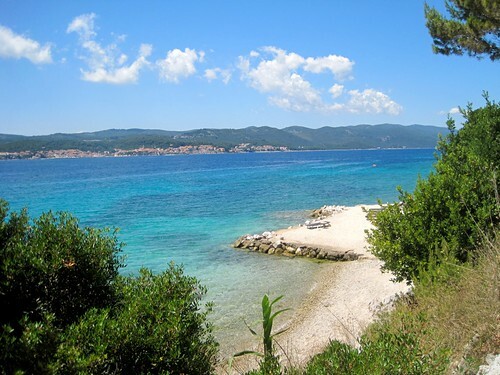 We would spend hours relaxing in front of the beautiful Adriatic Sea, alternating between swimming, reading and napping. Put best by Melissa, “The extent of my planning right now is to finish this chapter, turn over, and then take a nap.” If that isn’t relaxing, I don’t know what is! There is pretty much only one type of bread in Croatia, just baked into a bunch of different shapes and sizes! One of my bakery transactions was solo, since Azra was picking up something at the pharmacy next door. I stood in front of the wall of bread trying to figure out what to get, when the woman informed me that they were all basically the same and it was impossible to make a bad choice. How true that is when the bread is freshly baked each day! We got huge round rolls one morning, which were bigger than my face! Another morning, we decided to get the longer sandwich rolls. We also got to enjoy picnic lunches while on the beach in Italy, and were quite adept at pulling together to-go meals for long travel rides. 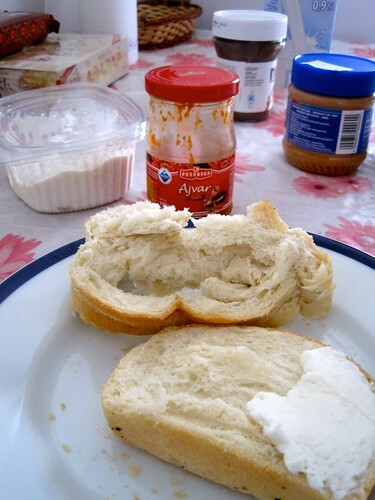 Simple meals of bread and cheese can be really satisfying when they are good quality, and eaten by starving travelers! Some fresh fruit on the side for balance and you have yourself a simple, portable and satisfying lunch. Question: What is your idea of the perfect picnic? 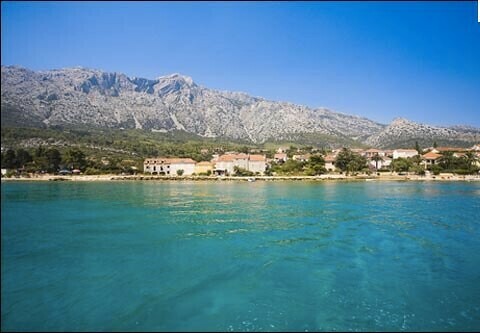 Who knew that it would be such great preparation for my time at my friend’s vacation home in Croatia, too? 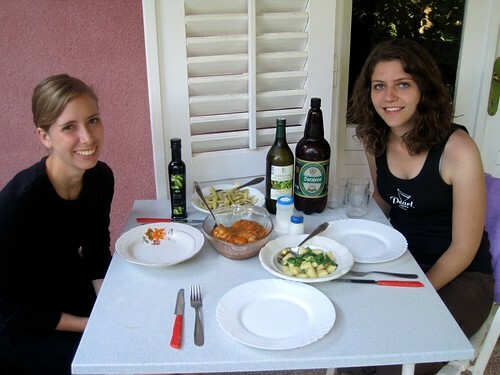 We were excited to be able to cook for ourselves for a few days, both to save money, and to see some veggies back on our plates after a few days eating out in Sarajevo! We brought along some fruits and veggies from a market in Sarajevo, and bought a few necessities from the supermarket as soon as we got there. Soon, our fridge was full with necessities: tons of fresh fruit, eggplant, cauliflower, onions, potatoes, chicken, peppers, beer, wine, gnocchi, tomatoes, cucumbers. We bought what looked good, paying little mind to what we were going to use it for. 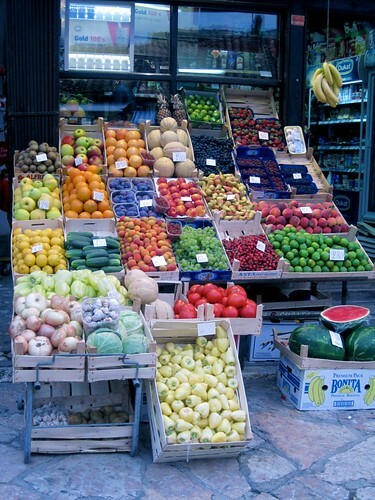 We could always run back to the produce stand, or swing by the store on the way back from the beach if we needed anything! We ended up making three meals at home, one of which I have already shared. The other two are coming up this weekend! Two bits of exciting news… I now have a Facebook page! I feel guilty for constantly spamming my friends and filling their news feed with post updates. If you are a friend who gets updates about new recipes and posts through Facebook, or are a regular reader, like my page to keep getting those updates! I will no longer be posting to my personal wall, so be sure to stay in touch! In much more exciting news, my best friends are getting married! Over the long weekend, I will back home in NJ for the wedding (you may remember her engagement celebration and bridal shower!) I am fortunate enough to be hosting her rehearsal dinner, so will be busy this evening tonight and tomorrow with preparations for that. And of course there will be no time for blogging on the wedding day – Saturday! I am so excited for my friends and am so blessed to get to share in their special day. 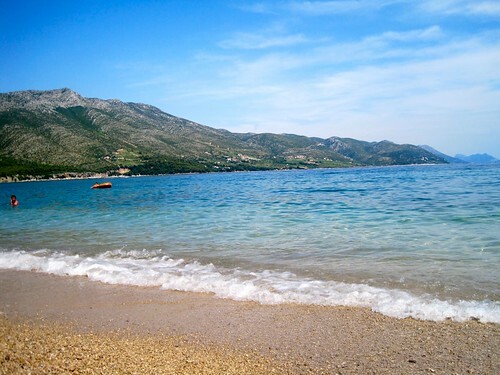 I hope you enjoy my prescheduled posts about my cooking adventures in Croatia in the meantime! Question: Are you a recipe-follower or creator in the kitchen? 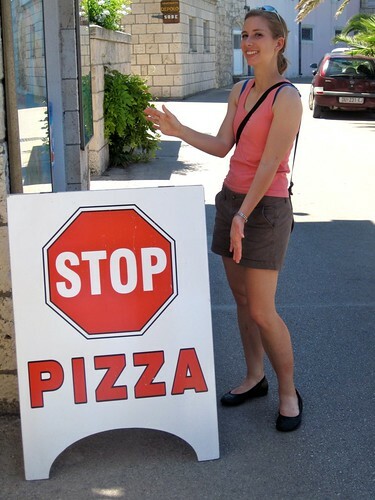 Restaurant options in Orebic were quite frankly underwhelming. We had been warned of this possibility by our friend before our arrival, but it was still disappointing to see that it was true. There were several restaurants dotting the shore line of the small town, but each boasted a very similar menu of pizza, Italian-style pasta dishes, or overpriced seafood. Further complicating the problem, everything contained ham! My friend, who is Muslim and cannot eat pork, therefore had even fewer options, the menu now pared down to three different pizzas she could choose from. Coastal Croatian cuisine is strongly influenced by neighboring Italy, but we knew the real deal was around the corner and did not want to overload on the available pasta options. Therefore, a limited selection of pizza it was whenever we went out! Don’t get me wrong, I love pizza. Maybe not as much as the next person, but a good slice of pizza can really hit the spot. I just usually don’t have that craving four days in a row. For this reason, we cooked at home for three dinners and brought picnic lunch to the beaches. Because we didn’t overload on pizza, it was really special when we did have it! Here are a few highlights from our restaurant outings! 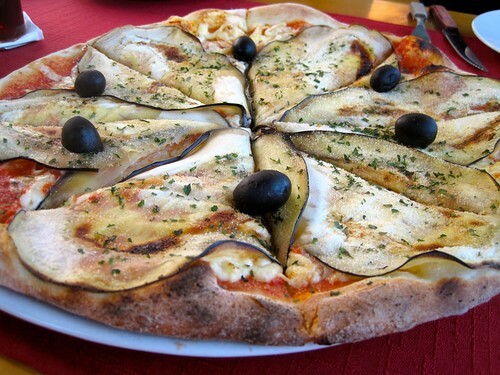 My favorite pizza had thinly sliced eggplant and fresh olives and was absolutely heavenly! Garlicky flavor with a great thin crust. We weren’t sure about ordering it at first because the English menu listed it as aubergine, which isn’t a term that any of us were familiar with. Azra actually had to look at the word in Croatian (the languages are similar enough to Bosnian) to figure out that it was an eggplant! We felt a little silly… but the pizza and the view made up for it! We enjoyed our pizza on our day trip to Korcula, a really beautiful old town that tries to take credit as Marco Polo’s birthplace, although I am still unconvinced of the historicity of their claims. The most surprising meal I ate was in Dubrovnik, where I ordered off the breakfast menu for lunch. The dish was entitled “The Dubrovnik” although I am unsure of why. 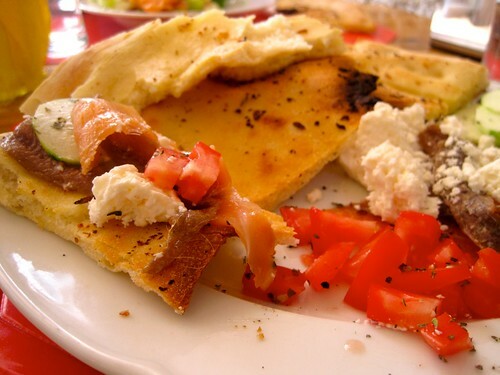 It was a delicious platter of homemade garlic flat bread with smoked salmon, a few anchovies, freshly made feta cheese, and tomatoes. I traded my college roommate a bit of flat bread for some cucumbers to fully round out my meal. I decided that I didn’t like the salted anchovies after eating two of the four, but fully enjoyed the smoked fish, fresh feta and vegetables. And the garlic bread was out of this world. I could have been satisfied eating that alone. Of course most dinners were washed down with a good house beer (toceno pivo). What is better than pizza and beer? Not only was the beer really good, but it was also really cheap. Even if we cooked dinner at home, we frequented a restaurant with great outdoor seating for a big beer. 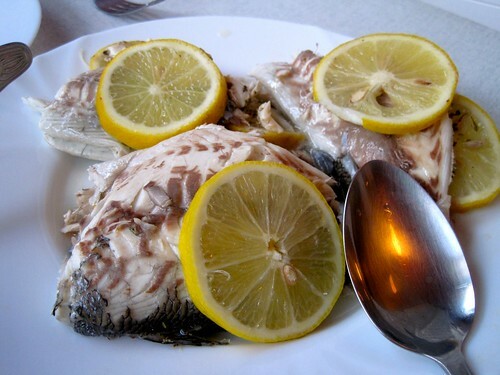 One thing I might miss about Croatian restaurants! We even caught a display of fireworks there one evening, coincidentally on the evening before July 4th. Even as ex-pats we found a way to celebrate the 4th with watermelon, beer and fireworks! Full disclosure: I am still on vacation! I got home from Europe, did a few loads of laundry, and hopped in my dad’s car the next day to meet my mom and sister at our favorite beach. We are camping in Cape May, NJ for the week to celebrate my Mom’s 50th birthday. This again has left me away from the blogging world and the kitchen, but normal posts will return soon enough! Until then, another story from my trip! Life in a beach town has a much different rhythm. You wake up with no alarm, check the heat and humidity on the front porch before deciding to go running, and lazily stroll to the market to get your food for the day. You stop at the bakery for fresh bread, a street-side stand for produce, a butcher for meat, and another stand for fish. Most places are open all morning, but the fish stand is only open from 7am-10am, which we found out the hard way on our first attempt. They have buckets on ice filled with the catch of the day, and they sell out each morning. I couldn’t tell you what any of the fish at the market were that day because their names were all in Croatian, but you basically could not make a poor choice. All of the fish looked very similar – some just a little longer or shorter, thinner or fatter. 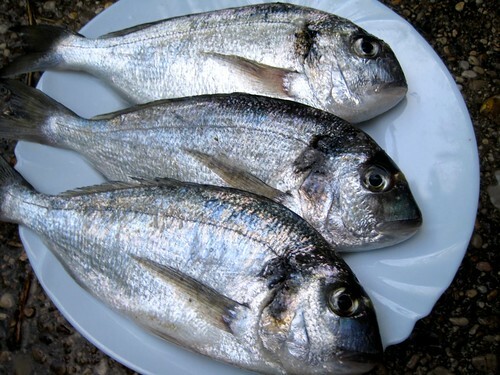 We chose 3 medium-sized fish, figuring it would be the perfect ratio for individual portions without the tiny, dangerous bones. After a day on the beach, we made a pit stop at an Internet cafe to get a little background in fish filleting and cleaning. Seriously, what did one do before Google? 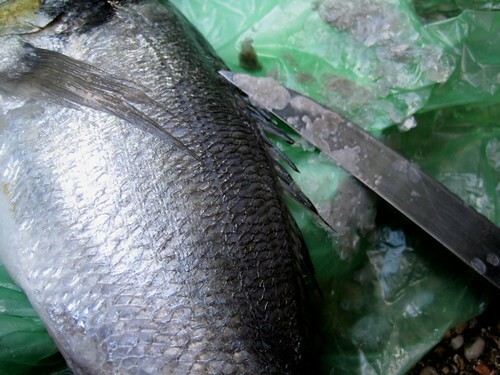 I read about how to take off the scales, which fins to remove, and how to gut and wash the fish. With a basic plan of action in mind, we headed home to start on our feast. I sat out under the outdoor shower, fish and a few sharp knives in hand. Realizing I didn’t quite have the proper equipment, I began to improvise slightly. I used a dull knife to take off the scales, a slightly sharper knife to get the fins, and a spoon for the insides. I decided against taking the bones out, figuring I would end up with lump fish meat instead of fillets. I was more than a little grossed out and will admit to a few girly freak out moments, especially when I was under attack from a swarm of bees (who knew they liked meat?!) But I got the job done! I finished rinsing them off and carried them inside. 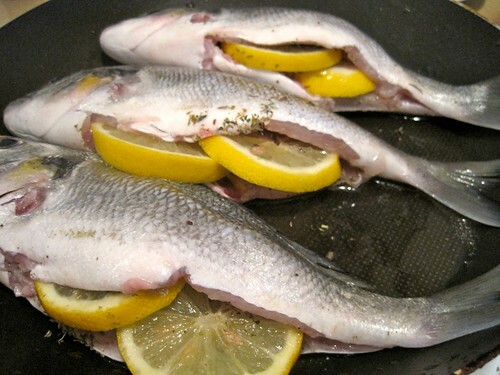 I cut up some lemon wheels and stuffed those with a little olive oil, salt, pepper and herbs inside of the fish. I then created a bit of a steaming device – I put a larger frying pan on the bottom and covered it with a slightly smaller pan on top. I let the fish cook for a few minutes on each side, watching what was left of the skin melt away in my improvisational set up. Once the fish was flaky and white, I took it away from the heat. I cut off the head and tails, and served what looked like beautiful fillets of fresh fish! Alongside, I mixed some fresh tomatoes and cucumbers together with a bit of olive oil, salt and pepper for my take on a traditional Eastern European salad. I also steamed up some cauliflower, and Azra made her version of her mom’s potato salad (some raw white onions, cooked potato slices, apple cider vinegar, olive oil, salt and pepper). The dinner was fantastic! 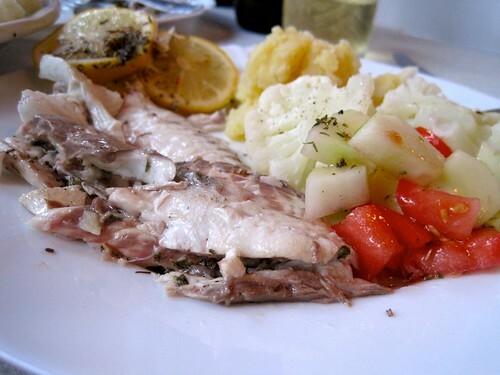 The fish was tender and flaky, and it was easy enough to avoid the bones. The lemon and herbs perfectly enhanced the flavor without overpowering anything. 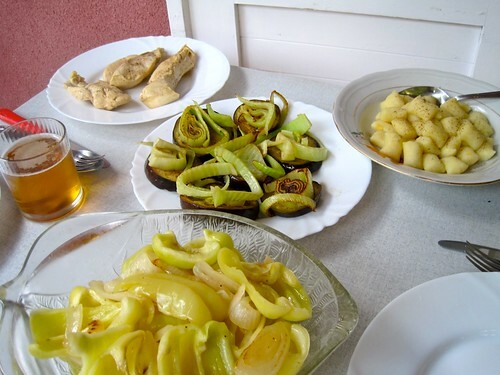 And our volumes of veggies on the side were a nice fresh addition, and were especially appreciated after a severe lack of veg in Bosnian cuisine (more to come on that!) We fully enjoyed our 4th of July fish feast, but it might be a long time before I am running to fillet fresh fish again. I am willing to try almost anything once when on vacation, though! And I’m off! I have been alluding to my big summer trip since the start of my blog, but have been vague about the details. Time for me to share a little bit about where I’m headed for the next three weeks! My friend, Azra, from college is originally from Bosnia. She and her family moved to Boston during the Bosnian War in the early 1990s, and I have learned a lot about Bosnian culture over the past 5 years. Her mom is incredibly hospitable and loves to feed me. Her meat pies are incredible, her chicken and rice moist and tender, and her coffee ever flowing. It is impossible to decline a meal when visiting her: “Oh, you just ate? I’ll make something small.” She slaves away in the kitchen while Mr. B yells loudly on the phone in Bosnian about politics; 3 courses later and barely able to move, I can feel the love she pours into her family and guests through her hospitality. Now I have my chance to go and visit their home country! My roommate from college and I leave today for an overnight flight from Boston to Sarajevo. We have very loose plans and have left most things up to our native tour guide. Whatever Azra thinks is worth to show off in her home city is okay with me! Hasn’t stopped me from reading just a bit online though… some tourism websites say to look forward to beautiful mosques and cathedrals, wartime memorials, beautiful bridges, and an interesting fusion of architecture between the original Ottoman rule and the later Austrian influences. I can’t wait to see Azra again and get to finally explore where she and her family are from! 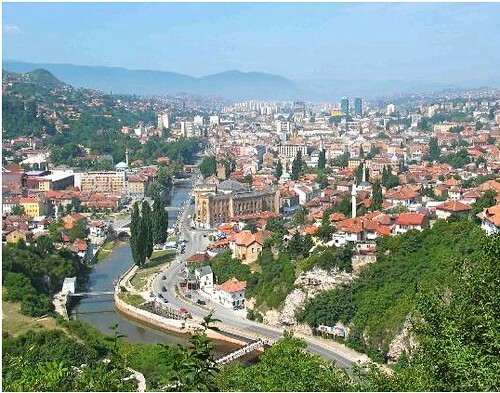 After exploring Sarajevo for a few days, we are heading with Azra to Croatia to stay at her family’s vacation home. 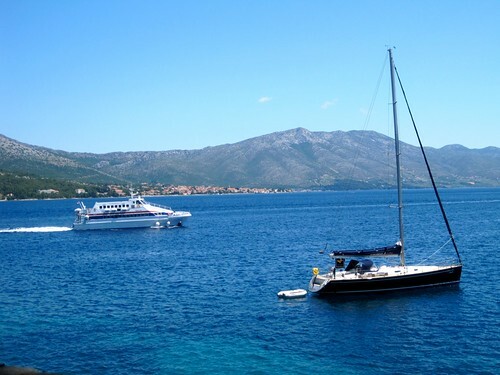 Croatia sits like a cap on Bosnia and is a more well-known tourist destination. 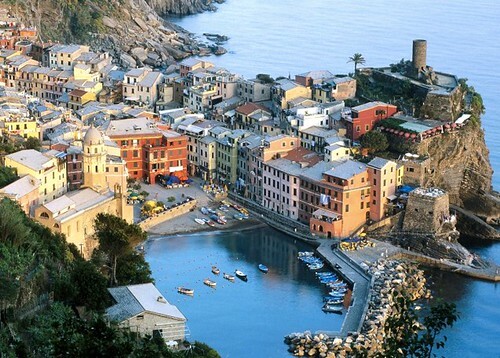 It is known for its hilly towns and beautiful beaches, so I am so excited to see this scenery in person! Again, we have left a lot of the planning up to our more well-known friend and guide. 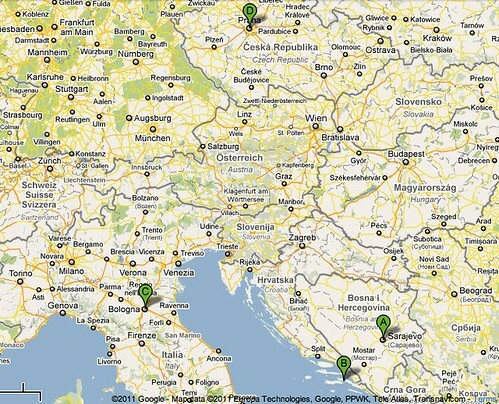 We will be visiting Orebic, Dubrovnik and Korcula, but will play most things by ear until we get there! I am beginning to explode with excitement as I type this… Those who have heard me talk about my trip in person know that I let out a little squeal of joy when sharing about our loose plans! This last stop in Prague was totally spur of the moment. Azra was over for dinner way back in January and we were looking at airfare to Bosnia and back from Italy. We had a map open, and she remarked how she had family friends in Czech Republic, which was so close and yet she was unsure if she’d get to go because she had no one to go with. 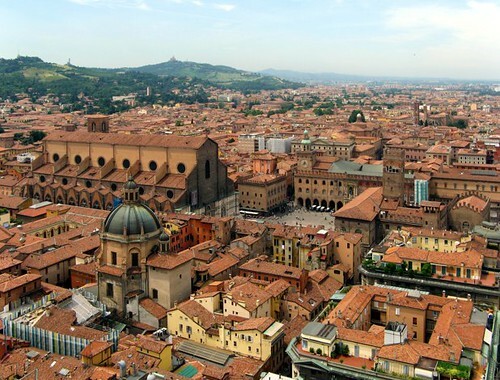 After a few clicks around Travelocity, we saw that it would be the same price for me to fly from Bologna to Prague to home as it would to go straight home from Bologna. 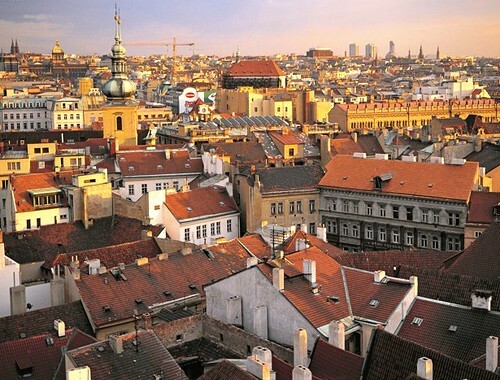 A host in Prague plus no added cost for airfare? I’m in! Our plans are again quite loose, as Azra’s friend has told us she will let us know where are the best places to see. We will have 5 days in Prague, so may even take a day trip to visit Dresden, Germany. 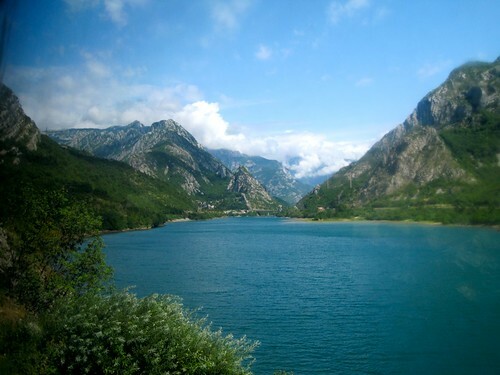 (It is only 2 hours away by train!) This will depend on funds and how much we have seen in Prague – keeping my mind and itinerary open! I am excited to be a free-spirit for the next few weeks. I am packing my suitcase lightly, leaving my laptop at home, and immersing myself in the company of my friends and the culture of other countries. 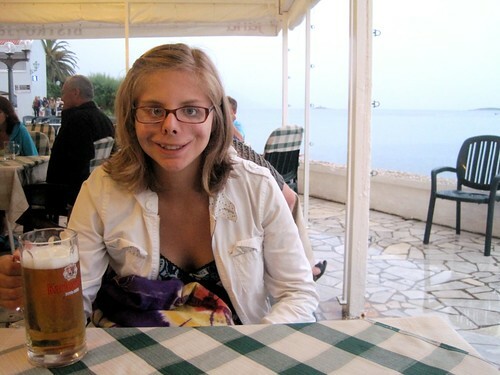 If I stumble into an Internet cafe or make an occasional email check on a friend’s computer, I will post brief updates about my adventures to let my friends and family know that I am alive and enjoying exploring! I also have some pre-scheduled posts (I have cooked more than I have posted in the past few weeks and have a few treats to share!) 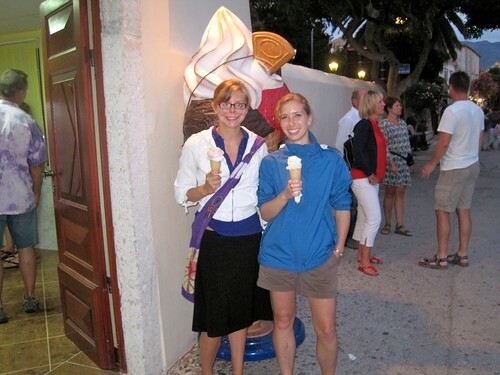 and will also have guest posts from my mom and my sister. All of these pictures are from tourism sites, but I will share much more of my adventures through my own pictures when I am back! Question: Do you have any vacations planned this summer?